UPDATE: Michael Kruger responds to my post on his own blog here. In this post, I briefly lay out some of Michael Kruger’s argument for the NT canon from the MSS to evaluate its worth for determining early canonicity of NT books. This is a pilot post, not finished research. I welcome your feedback in the comments. In Canon Revisited, ch. 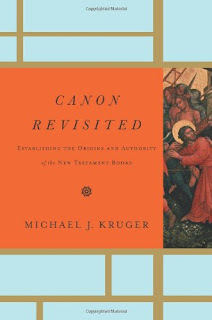 7, Kruger treats the “potentially fruitful” but often overlooked “study of the New Testament manuscripts themselves” (233) to discern what they might tell us about the formation of the NT canon. This chapter is divided into (1) The Quantity of Early Manuscripts, (2) Early Manuscript Collections with subsections treating the Gospels, Pauline Epistles, Catholic Epistles/Acts, Revelation, (3) The Early Christian Use of the Codex, and (4) Public and Private Manuscripts. Kruger notes that the first three areas focus on the broad features, while the last area treats internal features of early Christian MSS, noting the difficulty in attempting to separate public from private use (254). I want to focus my comments on the first and third areas and leave to others to talk about the second and fourth. First, Kruger states that there are over sixty extant MSS (in whole or in part) of the NT from this [2nd–3rd] period (234). “The sheer quantity of these New Testament texts is impressive” (235) and that most ancient MSS end up in garbage dumps or are damaged etc. These sixty MSS are then contrasted with the seventeen MSS of the Christian “Apocrypha,” noting three MSS of the Gospel of Thomas (236). On page 239, Kruger notes the problem with this argument, “Of course, it is important to remember that the relative popularity of books (on the basis of extant manuscripts) is not the whole story. The above evidence is offered only as a general confirmation of the trend we have seen in the prior chapter [a review of the early Christian testimonia relevant to canon], not as definitive in and of itself” (239). He notes that there is only one early copy of Mark (P45), but at this point, he should contrast the one MS of Mark with the three of the Gospel of Thomas, but he does not do so. However, he does note the eleven extant MSS of the Shepherd of Hermas showing its relative popularity within early Christianity. Interestingly and rightly, Kruger argues for the early canonicity of Mark and the noncanonical status of Thomas and the Shepherd on the basis of the other criteria he presented earlier in his book. This then raises the question in my mind: what is the value of the quantity of MSS in determining canonicity (N.B. the problem is also inherent in Dead Sea Scrolls research as well)? It seems to me, this evidence should normally be filtered through testimonia, but if that is the case, then how valuable are the MSS for determining canonicity? They may demonstrate relative popularity, but this conclusion leads to pitfall when describing an ancient’s canon as the example of the Gospel of Thomas and the Gospel according to Mark shows. Second, early Christians almost exclusively used the codex, not the roll (247–54). Kruger asks, “Why did Christians prefer the Codex?” They did so for many practical reasons, but “A more foundational and influential cause is needed to explain the transition” (249). He concludes that the most plausible cause is the link between the codex and the early development of the NT canon. He cites Elliott approvingly, “Canon and codex go hand in hand in the sense that the adoption of a fixed canon could be more easily controlled and promulgated when the codex was the means of gathering together originally separate compositions” (250). Thus, the codex is a “symptom” of the early development of the canon; “[I]t is a sign that Christians were already linking some books together and excluding others” (250). So the codex form was important. Kruger then turns to ask, “What books did Christians put into codex form?” The answer: all books that became part of the NT were copied onto the codex form (250–1). But Christians still used the roll format on occasion for other kinds of books (e.g. Irenaeus’s Against Heresies; Shepherd of Hermas; Gospel of Thomas; the Fayûm Gospel Fragment). And furthermore, this pattern does not suggest that any book copied onto a codex was considered scriptural by early Christians, since there are numerous extrabiblical books copied onto codices (e.g. Shepherd of Hermas; Gospel of Mary; Gospel of Thomas) (251). In the case of the Shepherd, at least, this might be problematic, for Kruger has already told us “some early Christians appeared to give the Shepherd scriptural status” (239n34). Later in the book, Kruger will mention that the Shepherd is found at the end of Codex Sinaiticus, but “we should remember our discussion above that it was common practice to place either disputed books or books found generally useful (though not canonical) at the back of such lists” (276; citing Horbury on the Muratorian Fragment). I don’t want to be overly critical on this point, but here, I would have to think that many will cry foul, for Kruger has shifted ground significantly. If my summary of ch. 7 is correct and the codex is as significant as Kruger argues, then the presence of the Shepherd in a NT codex would have to be significant on the basis of Kruger’s own argument. But Kruger shifts to the Muratorian Fragment, a different evidence set altogether. But J.K. Elliott in the same article in the very next paragraph to the one that Kruger cited approvingly above says, “We must assume that the authorities behind Codex Sinaiticus and Codex Alexandrinus considered these works canonical [the Shepherd; Barnabas; 1–2 Clement] and wished to promote them as such. Certainly the user of these codices would have accepted all the texts in their Bible codex as having equal status” (111). My conclusion from all this is that the material evidence is conflicting. True, the sheer quantity of NT MSS is impressive, and yes, that these same documents were always copied onto the codex is interesting. But the Gospel of Thomas has more early evidence than the Gospel according to Mark and many other books were written onto the codex form, and yet, early Christians do not describe these other books as canonical. Kruger goes on to describe how books at the boundaries were used and described in ch. 8. But my critique is that he and others should describe what early Christians actually thought about these books according to their clearest statements on the subject before turning to material evidence, which is not self-interpreting. That way, there appears to be no discord in the argument over a book like the Shepherd when arguing that it was an important book to early Christians, maybe even considered scriptural, but was never considered to be part of the NT canon. It is puzzling to me how many people answer the question “Why did Christians prefer the Codex?” without first saying "We don't know". wouldn’t that be true for most of historical study? Isn’t that why authors like Kruger and Meade have to interpret the data that is available? Timothy, if I understand PMH, he is pointing out a particular problem with the history of the analysis of this evidence, namely, a tendency to over read the significance of it. Is that right, Matthew? I would not have guessed there were more OT than NT MSS. Is there a source you can point us to? But your point is well received. Interesting, Matthew. How do you determine which OT MSS are (Early) Christian? Here is a very quickly thrown together list, almost certainly with errors and omissions. For speed of typing it is extracted from the Wikipedia list of Septuagint MSS rather than my own lengthy notes but the Wikipedia list is reasonably good as it appears to be based in part on the work of Fraenkel. Some of Rahlfs numbers can be subsumed into other MSS, a situation also applying to Gregory-Aland MSS, and some of the MSS are not strict biblical MSS, again a situation applying to the Gregory-Aland MSS. 818 3rd century Eccl.3:17f, 21f, 6:3-5.8-11 fragm. 828 3rd/4th century Sir. 29:15-18, 25-27 fragm. 854 3rd century Job 9:2,12-13 fragm. 858 3rd century Lev. 19:16-19.31-33 fragm. 861 3rd/4th century Sus., Dan. 1:1-20 fragm. 869 3rd/4th century Est. 4:4-5.8-11 fragm. 875 3rd century Dan. o' 1:2-5.6-10 fragm. 881 3rd century Is. 33:7-8.17-19; 40:13-14.24-26 fragm. 903 3rd/4th century Gen. 27:29-30.37-39; 28:1-5 fragm. 908 3rd century Exod. 31:13-14; 32:7-8 fragm. 922 3rd/4th century Ez. 5:12-6:3 fragm. 948 3rd century Is. 38:3-5.13-16 fragm. 962 III Gen. 8:13-9:2; 24:13-25:21; 30:20-35:16; 39:3-40:13; 41:9-46:33 fragm. 966 2nd/3rd century Jer. 4:30-5:1.9-14.23-24 fragm. 970 2nd century Exod 8:3.5-20; Deut. 28:36-39; 29:15-26.28; 30:5-7 fragm. 983 2nd/3rd century Par. II 29:32-35; 30:2-5 fragm. 990 3rd/4th century Tob. 12:14-19 fragm. 1000 3rd century Exod. 40:5-13.19-25 fragm. 2014 2nd/3rd century Ps. 118:27-63(?) fragm. 2025 3rd/4th century Ps. 7:9-12; 8:1-4 fragm. 2067 3rd century Ps. 8:3-9; 9:1.7-17 fragm. 2077 2nd century Ps. 81:1-4; 82:4-9.16-17 fragm. 2094 3rd century Ps. 67:35-68:4.8-14 fragm. 2117 3rd century Ps. 144:1-10.16-145:4 fragm. 2122 2nd/3rd century Ps. 1:2-3 fragm. 2157 3rd/4th century Ps. 21:20-28.31-32; 22:1-6; 23:1 fragm. Matthew, thanks for this list. Kruger had mostly 2C-3C MSS in mind, I believe. So your list of OT MSS is comparable. A quick perusal of the list shows that Psalms/Genesis dominates (cp. the several early MSS of John). There are some books not attested at all. Finally, there are examples of deuterocanonical such as Sirach and Tobit. So the trend is similar to the NT situation, no? John, just a few other observations on NT canon and NT codices from the OT side of things. Many early LXX/OG MSS of books such as Genesis and Psalms but few of books such as Ruth or Ezra-Nehemiah yet I’m not aware of anybody who uses the number of MSS as an indication of OT canonical status as opposed to an indicator of readership. With the NT however the number of MSS is often mentioned as if it somehow indicates canonical status. Codices enable more text to fit within a single publishing unit but few early LXX/OG codices have been identified as containing multiple books. In contrast it seems a reasonable number of early NT codices contain multiple books. I’ve yet to see any explanation as to why early Christians felt a greater need to include multiple NT books in a single codex but didn’t feel the same need to include multiple OT books in a single codex. That is an interesting difference. I need to look into this matter more. Thanks again for sharing your thoughts, Matthew. Matthew Hamilton, do you have a way I can contact you? I would like to follow up some matters that I think you can help me with. Let me know, thanks! Trevor, maybe. But the point here is that the codex medium was used for other documents than the early NT works. Make sense? Kruger has referenced the OT manuscripts himself as evidence for the Christian preference for the codex, additionally, Hurtado has made similar arguments as Kruger, so maybe your analysis is of the codex is not as obvious as you claim? Thanks, Tim. He doesn't analyze the OT codices in this chapter that I saw. Even if he did, it doesn't change my point. My questions pertain to Kruger's and others method over how they synthesize the significance of the codex with an overall historical description of the NT canon. One shouldn't overemphasize the significance of the codex in the face of such conflicting evidence as I pointed out above. If you follow my work on this matter long enough, you will know that I think we are on surer ground with the premise, codex doesn't equal canon, and attempt to synthesize and appeal to the material evidence to answer different but related questions. Does this make sense, Tim? I see your point clearer now, Trevor. Thanks. John Meade, if you'll be at SBL this year, I'll be presenting on how work combinations in manuscript hint at canon consciousness. It's another way in which the material features of MS arguably bear on the canon. I was planning on attending this section due to the other familiar names in the program. In the tradition of Hebrew Bible texts there is also mentioning about codices for purposes as study and for the correction of scrolls (which were and are prescibed) for use in the synogagues. See: Introduction to the Massoretico-Critical Edition of the Hebrew Bible by Christian D. Ginsburg, 1897 (I quote from the edition of 1966 by Ktav Publishing House, New York), page 242. In the Aleppo codex is told in the epilogue that every pious Jew was permitted to use the codex for comparison and correction of other manuscripts, but not for study purposes. Ginsberg used the term for this type of codices 'Standard Codex'. So there were in Judaism two traditions side by side: codices and scrolls. Now the Aleppo Codex is from the tenth century. In the Jerusalem (Palestinian) Talmud there is also a testimony about codices for correction (Standard Codices) in the Temple court of Jerusalem in the first century of the era, page 408. (Ginsburg's theory here about the final fixation of the Hebrew Bible texts in the first century BCE is doubtful.) Anyway the earlier proposed traditions of codices and scrolls side by side in the Jewish culture are marked with three historical moments: in the first, fourth and tenth century. There are certainly differences concerning the delivering of the Christian books, nevertheless there are simularities. It seems that we have to reckon with Standard Codices in the Christian tradition as well, certainly among scholars to study and compare variant readings. These codices are exspected to be in use already before the general canonization at the end of the fourth century. So the codices may be seen as signs of the desire for a reliable text in the Christian churches, but the canonization proces was of a different nature. It gave the answer to the question what are the right books for the Church, codices do not answer that question imho. Scott, interesting analysis here. Thank you for sharing, and it does seem to be good evidence against the notion that codex equals canon. Kruger as responded to your post over on www.michaeljkruger.com. Yep. I have left a link to his response in my post as an UPDATE. I'll be formulating my response shortly. 1. Only those books that were considered by the church to be from the Apostles or their associates were considered. 2. Other works could be included, if necessary, even if not from the Apostles, but were of devotional in nature. 3. Anthologies or harmonies could be used this way to help in Apologetics. BJWIII, have you ever seen this idea in print? I have not read it or considered it. I'm very skeptical that evangelism was the reason for the medium of the codex, but I would read something on this idea if you could point me to it. Thanks for chiming in. Why give Abraham a rough breathing? The most learned TC blog post ever?